I simply love birding Washington County, and my biennial “Washington County Weekend” van tour is little more than an excuse for me to bird the area. Of course, in doing so, I get to share the avian, scenic, and culinary glories of Downeast. So everybody wins! We set out from Freeport on Friday, 8/26. Not wanting to squander the entire morning just driving, we break up the trip by birding our way north. Corrina Marsh was our first stop this year, yielding Wood Ducks, side-by-side comparisons of Spotted and Solitary Sandpipers, several Ruby-throated Hummingbirds in the jewelweed, and a Northern Harrier coursing low over the marsh. Nearby Alder Stream held multitudes of Wood and Ring-necked Ducks, along with a couple of Pied-billed Grebes. More Wood Ducks were at Plymouth Pond, along with Common Loons, but we didn’t find the Sandhill Cranes that we had hoped for. After lunch at the flagship Dysart’s (no Maine roadtrip is complete for me without at least one grilled cheese from a Dysart’s), we strolled Essex Woods and marsh in Bangor. Four rare-so-far-inland Snowy Egrets were joined by a single Great, and we enjoyed superior views of Lesser and Greater Yellowlegs for comparison, along with more Solitary Sandpipers for comparison. Our entrance into Washington County via The Airline was met with a bang: our first birds in the county were a migrant flock of 18 Common Nighthawks bounding overhead. Dinner, and of course, pie, from Helen’s in Machias (not to mention the blueberry sangrias!) was a sure sign we had arrived. Without a doubt one of the best reasons for visiting this area in August is the massive congregation of gulls and seabirds, along with whales, that occurs in Head Harbor Passage, off of Eastport. Therefore, one of the highlights of this tour is our private charter on the “Pier Pressure” for whale- and bird-watching. And this trip most definitely did not disappoint. Sorting through 5,000-7,000 Bonparte’s Gulls finally yielded a Sabine’s Gull, a stunning adult, and one of the most sought-after species on the trip. It was nearly the end of the boat ride, my eyes were shot from combing through so many Bonies, and then I spotted it on the water, a short distance away. It took off and joined some commuting Bonies, and we tried to follow it, but despite Captain Butch’s best efforts, we unfortunately could not keep up with it as it headed towards Maine waters, and lost it as it mingled with a large flock of Bonies. But my goodness, what a stunning species it is! 300-400 Black-legged Kittiwakes was likely a ridiculously low guesstimate, as is the goodly 200+ Razorbills. Although Razorbills are regular in the passage in most summers, the numbers this year have been exceptional. Scattered Great Cormorants among the multitudes of Double-cresteds, plenty of Black Guillemots, about a dozen tarrying Common Terns, and a total of 15+ Bald Eagles added to the show. A total at of 5 Lesser Black-backed Gulls of various ages were detected, but I admit to not sifting through every large gull – it was the rare “hooded” gulls that we were on the lookout for! Juvenile and adult Black-legged Kittiwakes with Bonaparte’s Gulls. Lots and Lots of Bonaparte’s Gulls (and Black-legged Kittiwakes). Razorbill father with juvenile (L). Harbor Seals and Harbor Porpoises were common, and we visited with some massive Gray Seals as well. We spotted a single Minke Whale, and then drifted with a massive Fin Whale for a little while. While we only has one fly-by unidentified phalarope and did not find a single tubenose (despite spending some time off of East Quoddy Head), the trip was an incredible success, because, well…Sabine’s Gull! We fueled up on arguably the best lobster rolls in the state at the Quoddy Bay Lobster Company, before spending some time seawatching at the end of Clark St (hoping for the Sabine’s to reappear!). Close-up kittiwakes and Bonaparte’s Gulls were nice, as were a couple more Lesser Black-backed Gulls. However, it was the molting adult Black-headed Gull that was the welcomed consolation prize. We slowly worked our way up the peninsula, checking out various viewpoints, and seeing a smattering of shorebirds and lots of Black Guillemots in the process. Finally, at the Sipayik Trail at the ballfields at Pleasant Point, a nice mix of birds as always included a trio of out-of-place Sanderlings, a few Bobolinks, more Bonaparte’s Gulls and Black-legged Kittiwakes offshore, and 2 Nelson’s Sparrows in the marsh. Another close Northern Harrier coursing low over marsh stirred the pot, kicking up more Green-winged Teal and Least Sandpipers than we thought were present. Dinner at the Hansom House in Dennysville left much of the group speechless. It is a very interesting, and very different place indeed! Day 3 found us making an even earlier start, but we were rewarded with our efforts with a dapper male Spruce Grouse doing its thing in the trail at Boot Head Preserve in Lubec. Following that success, some edge- and sky-watching at the bog there yielded fly-over Red Crossbills (2+), 3 Pine Siskins, and among the scattered warblers in small flocks working the edge, at least 6 Palm Warblers (local breeders). We also began to truly get a sense for just how incredibly abundant Red-breasted Nuthatches are in the forests around here right now – undoubtedly portending a great finch winter to come! Our Lubec-area day continued with a stroll at Quoddy State Park, where Red-breasted Nuthatches were once again downright deafening. At least 4 Red and 3+ White-winged Crossbills were detected, and we spotted a Philadelphia Vireo within one of the mixed flocks around the edge of the bog. There, we also took time to enjoy the plants of this fascinating habitat, including carnivorous Pitcher Plants and the two species of sundews. Our busy and productive morning continued at the Lubec Bar and Flats, where a large number of shorebirds had aggregated. 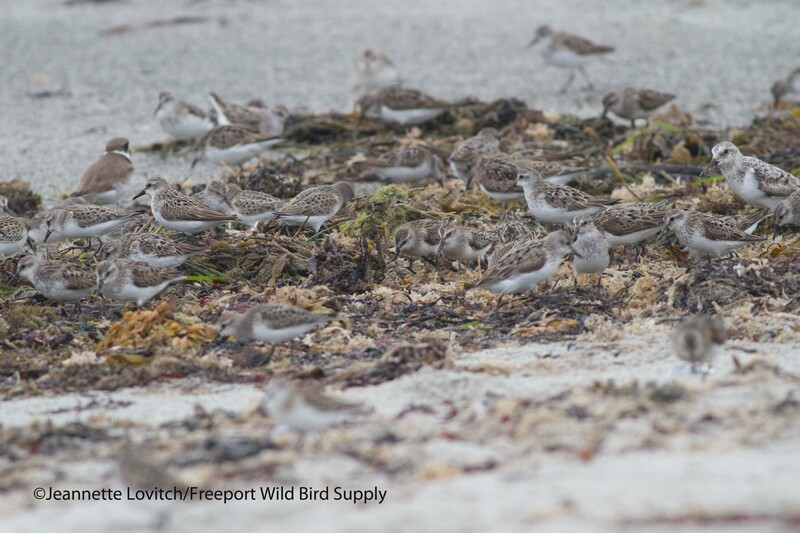 Although it has apparently been slow here recently, we found a rather decent number and diversity of shorebirds. I do wish we were arrived about a half hour earlier, and had about an hour more time here, however! About 1500 Semipalmated Sandpipers and 250+ Least Sandpipers were joined by 75-100 Sanderlings (a surprisingly high count for here), 60-80 Black-bellied Plovers, a handful of Semipalmated Plovers, 1 Ruddy Turnstone, and 1 Whimbrel. Lunch at Cohill’s was a hit. In fact, the Shepherd’s Pie turned out to be the favorite meal of the trip for two people, although I was quite over-satisfied with my “Drunken Potato” with Guinness gravy and cheese curds. Following the obligate stop at Monica’s Chocolates – where we left with the cooler overflowing! – we headed back to Quoddy State Park for some relaxing sea-watching. In 1.5 hours, we tallied at least 14 Sooty Shearwaters (making up for the lack of them on our boat trip), counted 10 juvenile Laughing Gulls (they seemed unusually frequent up here this year, and of course, we tried to string each of them into a jaeger! ), picked out a few Razorbills, and spotted two Northern Gannets, and excitingly, two Atlantic Puffins. A few more Great Cormorants and a dozen Black-legged Kittiwakes were noted, for those who hadn’t yet gotten their fill. Scanning the flats again, but this time from the roadside, we finally picked up a single White-rumped Sandpiper, increased our tally to 6 Short-billed Dowitchers, and otherwise improved on our looks at the other species from earlier. While Pike’s Puddle was nearly dry and devoid of birds, the beach on the other side of the road yielded a juvenile Baird’s Sandpiper. That was cause for celebration enough, but the show was stolen when a Merlin came out of nowhere and nabbed an unsuspecting Semipalmated Plover. That’s a hearty meal for even a female Merlin, so after quickly dispatching it, she struggled to drag it across the rocky beach before finally taking off and disappearing into the trees to have her dinner. As did we…and no Derek Lovitch tour is complete without a brewery, apparently, so our evening’s destination simply had to be the new Lubec Brewing Co! No visit, tour or otherwise, gives me enough time to bird this area. This four-day weekend is truly just a sample, and despite my interests in going back to the Lubec flats or the Eastport gulls, after two long days of jam-packed birding, we began our day (after a leisurely breakfast at Helen’s) simply by watching the shorebirds behind our motel. 606 Semipalmated Sandpipers, 41 Semipalmated Plovers, 20-30 Least Sandpipers, and another out-of-place-on-mud Sanderling surpassed expectations. I like to slowly mosey back home, and I like to mix in a new site or two on each tour. 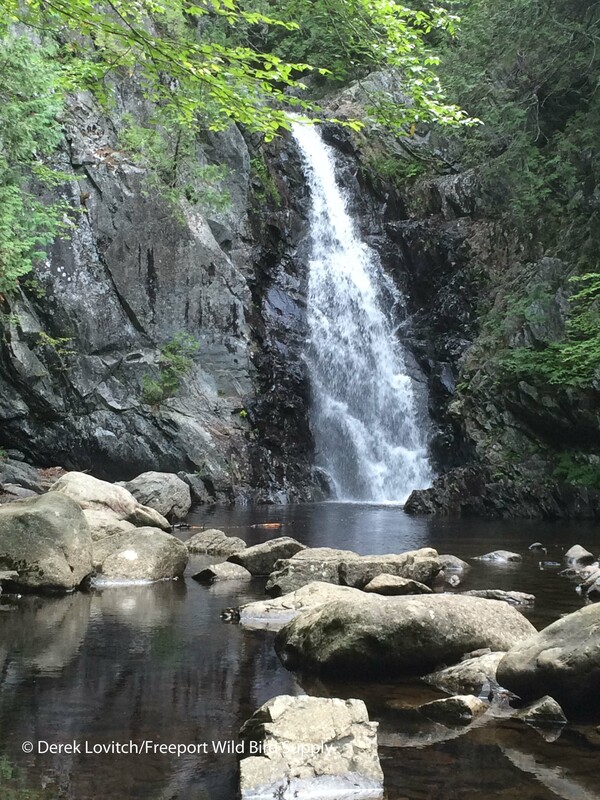 Therefore, instead of racing east only to start the drive back west, I decided to do some exploring, beginning with the Mason Bay Conservation Area on the Jonesboro/Jonesport border. More Red-breasted Nuthatches and a couple of mixed species foraging flocks were indication that this is a spot worth checking in the breeding season, and at the end of our stroll (which included some more botanizing, a few butterflies, and fun with Tent Caterpillars) another Red Crossbill passed overhead. A typical stop for me when taking Route One back towards Ellsworth is Addison Marsh. Although we arrived at high tide and the productive mudflats and river edge were no longer visible, the salt pannes provided some entertainment. Although diversity was low, we could not have asked for more enjoyable views of a mixed flock of Least and Semipalmated Sandpipers. A couple of Solitary Sandpipers and a Greater Yellowlegs passed overhead, and a couple more Northern Harriers and Bald Eagles, along with three migrant Ospreys, stirred the pot. A great opportunity to compare Least and Semipalmated (center) Sandpipers. Exploring access points to scan Flat Bay in Harrington, we found some shorebirds here and there as the ride finally started to go out. As shorebirds were appearing off of Oak Point, I realized lunchtime was approaching, and I decided to get back into the van before I spent the next three hours making everyone (myself most definitely included) starve as I sorted through shorebirds. Besides, a rapidly increasing northwesterly wind was making it challenging to see any birds in the distance (our first experience with anything other than perfect weather all weekend!). But to be honest, most of that exploring was just to put us in position for Vazquez Mexican Takeout in Millbridge for lunch (second only to Helen’s pie as sought-after “twitches” for this tour!). I ate too much, as usual. Actually, gluttony was a regular theme of this tour, as many of us were forced to roll out of many of our meals. Apparently, we were all single-handedly trying to jumpstart the region’s economy with our consumption! A quick check of Hog Bay was thwarted by the increasing winds, and that was a sign it was time to begrudgingly bring our birding to an end and make our way back home. From Sabine’s Gulls to Spruce Grouse, from thousands of Bonaparte’s Gulls to hundreds of Red-breasted Nuthatches, from blueberry pie to “tacos as good as in McAllen, Texas” (according to one of our transplanted participants), and from pitcher plants to Fin Whales, there is no doubt that I will be looking forward to my next tour to this awesome area! In fact, one participant on this year’s tour has already signed up for 2018. That should tell you something! This entry was posted in Private Guiding and Tours and tagged "Birds, Baird's Sandpiper, Birding, Black-headed Gull, Black-legged Kittiwake, Bonaparte's Gull, Boot Head Preserve, Easport, Gray Seal, Great Cormorant, Head Harbor Passage, Least Sandpiper, Lubec, Machias, Merlin, migration, Quoddy State Park, Razorbill, Red-breasted Nuthatch, Sabine's Gull, Semipalmated Sandpiper, Spruce Grouse, Washington County on September 3, 2016 by Derek. “Shorebirds and Beer” was our first-ever “Birds on Tap – Roadtrip!” in partnership with our friends at The Maine Brew Bus last August. Now our 6th trip together, combining casual yet instructive birding in some of the state’s best seasonal hotspots with visits to two of our fantastic local breweries, we planned a return to Scarborough Marsh – where it all began! And by popular demand, we added a second date. So this year, we had two “Shorebirds and Beer” departures, on August 7th and again on August 14th. Both visited Scarborough Marsh, focusing our efforts on migratory shorebirds, but combined pairs of very different breweries. We began the August 7th visit to Scarborough Marsh at the Eastern Road Trail. A nice variety of birds were observed, including a couple of very cooperative singing Nelson’s Sparrows. Unfortunately, we found our destination, the salt pannes on the northern side of the marsh to be completely bone-dry due to this year’s drought. Needless to say, the numbers of shorebirds were not what we were hoping for. In fact, other than a few small groups of Least Sandpipers popping in and out of the grass, the pannes – often the most productive place in the entire marsh at this season – were completely devoid of shorebirds! However, along the road, we had some good instructive lessons, including ultra-cooperative Least Sandpipers than began our introduction into shorebird identification. We learned how breaking shorebirds down into family by shape and size first narrows the choices, and allows you to focus on just a few species to identify. We even had a perfect example of this, when three members of the genus Tringa were standing side-by-side as a dainty Lesser Yellowlegs joined a couple of Greater Yellowlegs while a bulky Tringa-on-steroids, Willet (of the Eastern subspecies, for the record) looked on. Heading over to Pine Point as the tide rapidly rolled in, various human disturbances in Jones Creek limited shorebird diversity, but we could not have asked for more cooperative Semipalmated Sandpipers and Semipalmated Plovers (about 200 and 100, respectively) that really allowed us to practice our plover vs. sandpiper feeding shape and style dichotomy. We then moved on to work on specific identification. The remainder of our birding time was spent scanning the last of the distance sandbars (adding Black-bellied Plover to the shorebird checklist), before one of the members of the group called me over to check out an odd bird she found in her scope. It was an American Avocet! While distance and heat shimmer precluded documentation photos, everyone was treated to a look or two in the scope of this very rare-in-Maine bird that isn’t seen every year anywhere in the state. While the long, fine bill was barely discernable at the distance, the very long legs and overall tall size (compared to nearby gulls) coupled with the distinctive tri-colored appearance (buffy head and neck, white underparts, and black wing with a broad white stripe) looks like no other. And then it was time for a celebratory beer! After a celebratory hand-pie for lunch, of course. First up was Barreled Souls in Saco, the only brewery in the country that is producing 100% barrel fermented beer in their Burton-Union system. Producing a mere 400 barrels a year – yet still offering 10-12 brews on tap at all times! – this time-consuming process which included two stages of fermentation, allows for the creation of some very complex beers. Our samples today began with Half-Shilling, a very-light-bodied and low-ABV Scotch Ale as an introduction. Rosalita followed, using agave nectar in the primary fermentation and then steeped with hibiscus flowers during secondary fermentation, making for a very floral and subtly-sweet brew. Space Gose was next, a summer refresher made with Maine sea salt, lemon zest, and coriander. By request, we then did a complete beer-wise-180 and shifted over to a heavy Barrel-aged MCAM – a very unique breakfast porter made with cinnamon, French toast, and bacon! The spice, sweet, and smokiness were evident, as were the hints of bourbon from the bourbon barrels it was aged in. It was a potent, and very tasty, beer and a good representation of Barreled Souls’ creativity. Kristi shows off her very-appropriate for a birding/beer tour tattoo. Our final destination of the day was Lone Pine Brewing in Portland. We began with their flagship Portland Pale Ale, using 90% Aroostook County-grown malts. This is a really great pale, with lots of flavor but incredibly smooth and lacking bitterness. Pale ales are occasionally “boring” to those who like a lot of hops, but this exceedingly well-balanced beer could be a new go-to for quite a few of us on the tour. Their new Brightside IPA was next on our agenda, and I would put this right up there with the best IPAs in the state. Bright and citrusy, yet without that overwhelming bitterness that often pervades stronger IPAs (this one clocks in at a potent 7% alcohol), it may be way too easy-drinking. It was also a very “accessible” IPA for the non-hopheads. One member of group in particular, who normally doesn’t like IPAs at all, was actually quite a fan of this also well-balanced beer. For me, a sign of a truly great beer is one that is so good is that it appeals to those who normally don’t like that particular style. The following weekend, we once again began our birding at Eastern Road. Despite some rain in the past few days, however, the salt pannes were still dry. But to and fro, we encountered a nice mix of shorebirds, including some unbelievable cooperative Least Sandpipers once again. This one was phone-binned (a photo taken with an iPhone through my binoculars)! Three Spotted Sandpipers – our first shorebirds of the day, actually – were encountered as we began our walk, and a decent number of Semipalmated Sandpipers were in the dried pannes. Both Lesser and Greater Yellowlegs were seen together for instructive studies. A distant hunting Northern Harrier, more singing (but this week, not seen) Nelson’s Sparrows, and lots of Cedar Waxwings and Song Sparrows foraging in the trailside scrub were among the highlights. We also took the time to watch Common Wood-Nymph butterflies, Great and Snowy Egrets, and stopped to enjoy the magnificently beautiful color of the eyes of Double-crested Cormorants. On the walk back, with the tide just starting to recede, we had the opportunity to check out a few Semipalmated Plovers, Semipalmated Sandpipers, and a Least Sandpiper all side-by-side, just about 20 feet away. A quick stop at the Pelreco marsh produced yet more Least Sandpipers, a better view of the details of Greater Yellowlegs, two spiffy adult Little Blue Herons, and most importantly: Patches! Arguably one of the rarest birds in the world, this Tricolored Heron x Snowy Egret hybrid that has been frequenting the marsh for the past 3 years put on quite a show for us. It could – hypothetically – be the only one of its kind! Thanks to a change in brewery itinerary for this second run of “Shorebirds and Beer,” I was able to stall at the marsh long enough to allow enough water to flow out that mud was rapidly being exposed at Pine Point. And with it, excellent numbers of all of the expected shorebirds began to appear: 400+ Semipalmated Sandpipers, 300+ Semipalmated Plovers, 150+ Black-bellied Plovers, 22 Short-billed Dowitchers, 8 “Eastern” Willets, 6 White-rumped Sandpipers, 4 Ruddy Turnstones, a few Least Sandpipers, and 2 Greater Yellowlegs. No American Avocet though, but a hunting Peregrine Falcon zipped through, causing quite the ruckus. And then it was once again beer o’clock, and today we began our beer-ing tour with a visit to South Portland’s Foulmouthed Brewing. Only open for 7 weeks, it was a new destination for everyone on today’s tour – myself included – and we learned all about the owners, the fledgling (see what I did there?) brewpub (yup, they opened a restaurant too), and their wide range of beers. We even enjoyed a not-quite-ready-for-prime-time sample of their new “Blue Balls,” a Belgian dark, strong beer with blueberries. Still a week or two from being finished, it was a great introduction to their creative brewing side. Inside at the brewpub, we sat at the big kids’ table and sampled four of their current offerings. Beginning with Brat, a German-style session with its bright and clean Noble hop finish, we moved onto Half Wit, a “hybrid” (not of heron and egret, mind you) of a Belgian Wit and an American Pale. A favorite of many on today’s visit, it was smooth and accessible, with enough body and flavor to hold its own. Kaizen Saison was up next, with its rotating hops producing a different flavor and aroma profile with each batch. We finished up with Rhubarb de Garde, a strong amber aged on rhubarb. I found a little extra sweetness and especially just the hint of tart from the rhubarb complimented each other nicely. Our final beer stop of the day was a return trip to Lone Pine Brewing. Tom once again took us through their methods and philosophy, and shared with us their Portland Pale Ale and Brightside IPA. The more I drink the Portland Pale, the more I love this perfectly balanced beer. And Abby was dressed in our honor today. While Don, always attentive, looked like he had just spotted a Blue-footed Booby. With our final sips of Brightside, the second installment of Shorebirds and Beer came to a close and it was time to head back home. Every day is different during the window of shorebird migration, and these two visits to Scarborough Marsh exemplified that. 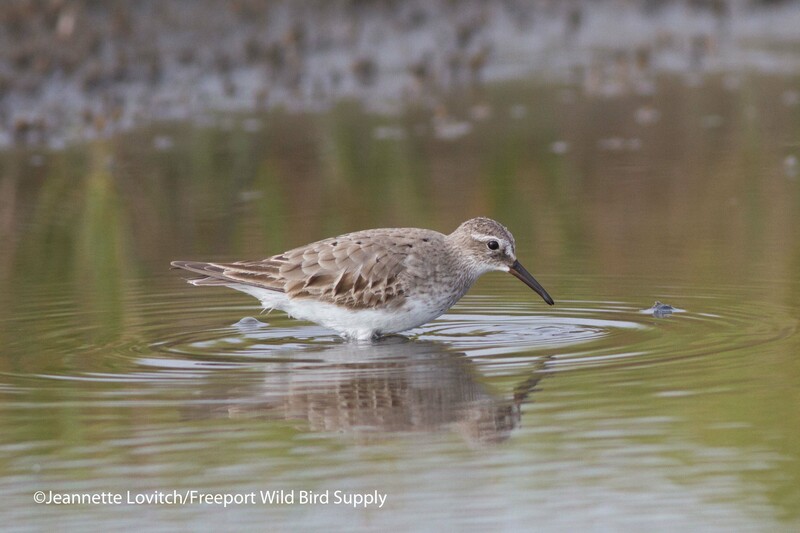 A wide range of shorebirds were studied, as we started to expand our identification – and appreciation – toolbox. And between Barreled Souls, Lone Pine, and Foulmouthed, we were exposed to a wide range of beer styles and methodologies. And both are the goals of our Birds on Tap – Roadtrip! series: exposure to some of our seasonal birding highlights and our vast array of fantastic local breweries. 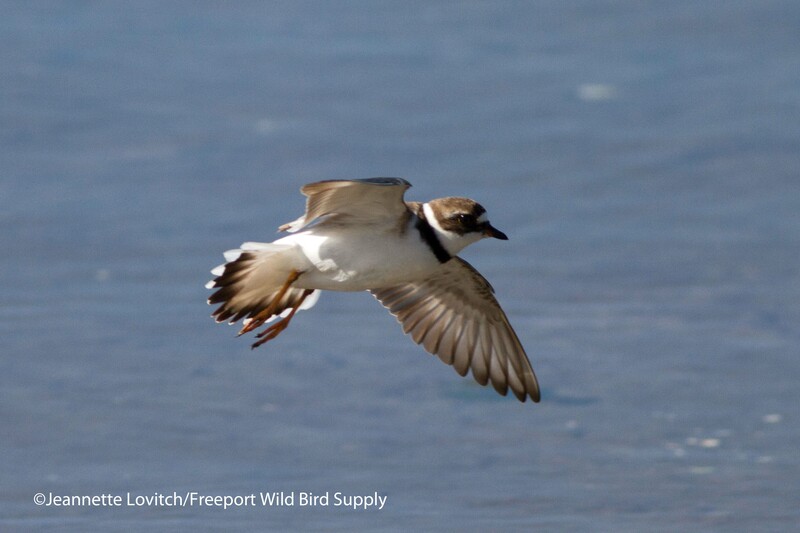 We hope you’ll join us for our next roadtrip, on October 9th, when we head to the deep south to visit Kittery’s Fort Foster and Seapoint Beach for our birding, and Tributary and Hidden Cove Brewing for our beering. Hope to see you then! This entry was posted in Birding in Maine and tagged "Birds, American Avocet, Barreled Souls, Birding, Birds on Tap, Birds on Tap - Roadtrip!, Foulmouthed Brewing, Freeport Wild Bird Supply, Great Egret, Greater Yellowlegs, Least Sandpiper, Lesser Yellowlegs, Lone Pine Brewing, Maine Brew Bus, Scarborough Marsh, Semipalmated Plover, Semipalmated Sandpiper, Tours, Tricolored Heron x Snowy Egret hybrid, trips on August 17, 2016 by Derek. 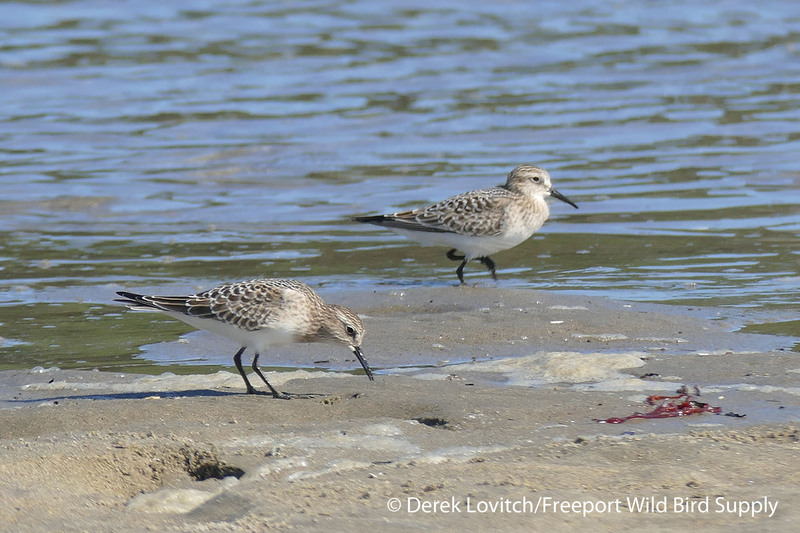 Two juvenile Baird’s Sandpipers at Popham Beach State Park on Friday morning, “rare-but-regular” fall migrants. August is for shorebirds. 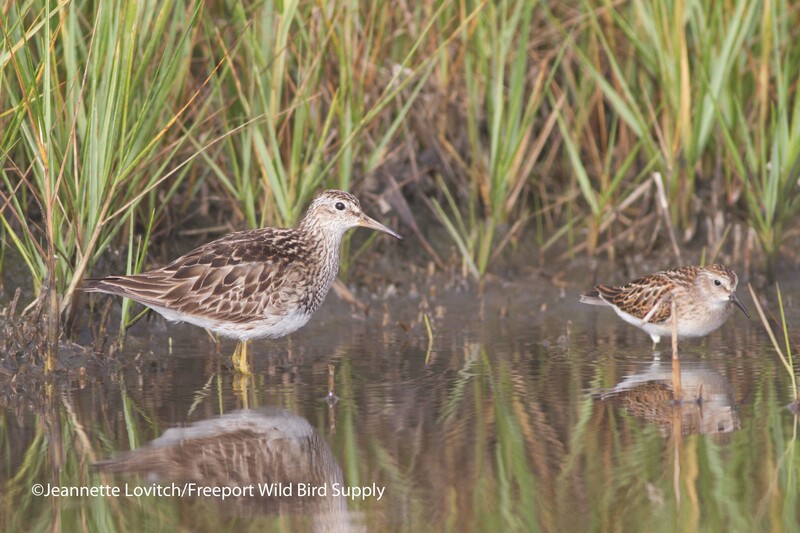 Although the “fall” southbound migration started in late June (when the first non-breeders begin to turn around to mosey back south) and continues into November when Purple Sandpipers are still filling in, August is the month of peak numbers and diversity in Maine. Most weeks from mid-July into September of recent years, I post a weekly “shorebird high counts this week” summary to my weekly “Additional Highlights This Week” summary posts to the Maine-birds listserve. While I do hope this is interesting and of value to folks, I also do it to organize my own notes, allowing me to quickly reference the peaks and valleys of particular species with ease should I need to. I generally only post this when I have hit at least two “primary” and at least one “secondary” site each week, to make the numbers meaningful. And I prefer at least one prime high tide location (Eastern Road Trail in Scarborough Marsh, Biddeford Pool Beach/Ocean Avenue, or Popham Beach State Park in some years) with one low or mid-tide hotspot (Pine Point, Hill’s Beach/The Pool, or Popham and nearby environs). This week was a particularly productive week for my own shorebirding, so this week’s summary is a helpful future reference for me. I also thought it was worth going into a little more detail, since it yielded a goodly 21 species (plus one subspecies) and some excellent totals. I hit the low-tide hotspot of Pine Point on Monday with Jeannette, followed by the Eastern Road Trail at high tide later that afternoon. Jeannette and I spent the incoming to high tide at Biddeford Pool Beach on Tuesday, and on Friday, Serena Doose and I visited Popham on the incoming to high tide. Additionally, Jeannette and I checked one of the “secondary” sites, Brunswick’s Wharton Point on Tuesday and on Thursday I visited Wells Harbor before the evening’s Scott Weidensaul talk that we co-sponsored with Birds and Beans coffee and York County Audubon. It’s always good to hit a freshwater location for diversity and high counts of pond-preferring-migrants, so when my Poplar Hut Tour Group with Maine Huts & Trails visited the Carrabassett Valley Snowfluent Ponds on Sunday, my high counts of Spotted and Solitary Sandpipers were acquired, along with my only Wilson’s Snipe of the week. And, as if often the case during the peak of shorebird migration, there is some other “incidental sighting” of a migrant in some weird place – but not as weird as the Whimbrel (my only of the week) foraging at 4,200 feet atop Sugarloaf Mountain that Paul Doiron, Kristen Lindquist, and I observed on Sunday afternoon. While I knew they forage on mossberry during migration, such as in the bogs Downeast, I was most definitely not expecting one up here! AMERICAN GOLDEN-PLOVER: 1 ad, Eastern Road Trail, Scarborough, 8/24 (with Jeannette). 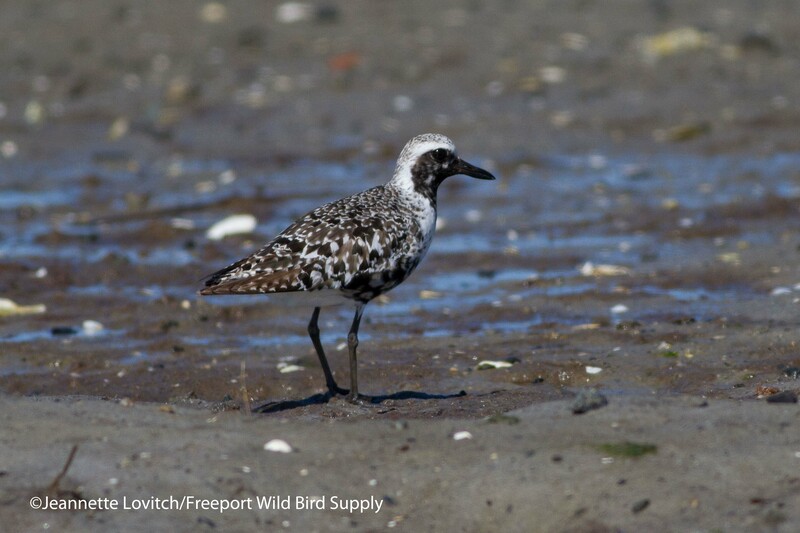 Black-bellied Plover: 160, Pine Point, Scarborough, 8/24 (with Jeannette). Semipalmated Plover: 350, Pine Point, 8/24 (with Jeannette). Killdeer: 3, Pine Point, 8/24 (with Jeannette). AMERICAN OYSTERCATCHER: 5, Pine Point, 8/11 (with Jeannette). Greater Yellowlegs: 12, Wharton Point, Brunswick, 8/25 (with Jeannette). Lesser Yellowlegs: 38, Eastern Road Trail, 8/24 (with Jeannette). “Eastern” Willet: 8 juvs, Pine Point, 8/24 (with Jeannette). “WESTERN” WILLET: 1 juv. (FOY), Pine Point, 8/24 (with Fyn Kind, Gary Roberts, and Jeannette). Solitary Sandpiper: 4, Carrabassett Valley Snowfluent Ponds, 8/23 (with Poplar Hut Tour group). Spotted Sandpiper: 5, Carrabassett Valley Snowfluent Ponds, 8/23 (with Poplar Hut Tour group). Whimbrel: 8, Wells Harbor, 8/27. Ruddy Turnstone: 8, Pine Point, 8/24 (with Jeannette). Sanderling: 40, Biddeford Pool Beach, 8/25 (with Jeannette). Semipalmated Sandpiper: 1000, Biddeford Pool Beach, 8/25 (with Jeannette).. Least Sandpiper: 75 mostly juv, Eastern Road Trail, 8/24 (with Jeannette). White-rumped Sandpiper: 80-100 adults, Eastern Road Trail, 8/24 (with Jeannette). 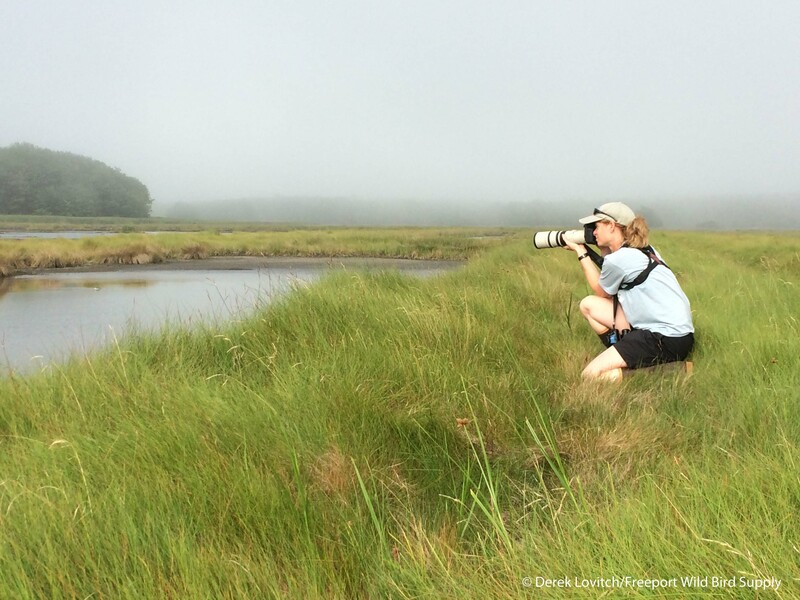 BAIRD’S SANDPIPER: 2 juveniles, Popham Beach State Park, Phippsburg, 8/28 (with Serena Doose). Pectoral Sandpiper: 6, Pine Point, 8/24 (with Jeannette). STILT SANDPIPER: 4 ads, Eastern Road Trail, 8/24 (with Jeannette). Short-billed Dowitcher: 19 juveniles, Pine Point, 8/24 (with Jeannette). Wilson’s Snipe: 1, Carrabassett Valley Snowfluent Ponds, 8/23 (with Poplar Hut Tour group). Furthermore, writing this blog gives me a chance to show off some of Jeannette’s photography! These are just a few of the shots she got during our visit to Scarborough on Monday. Adult Black-bellied Plover, Pine Point, 8/24. 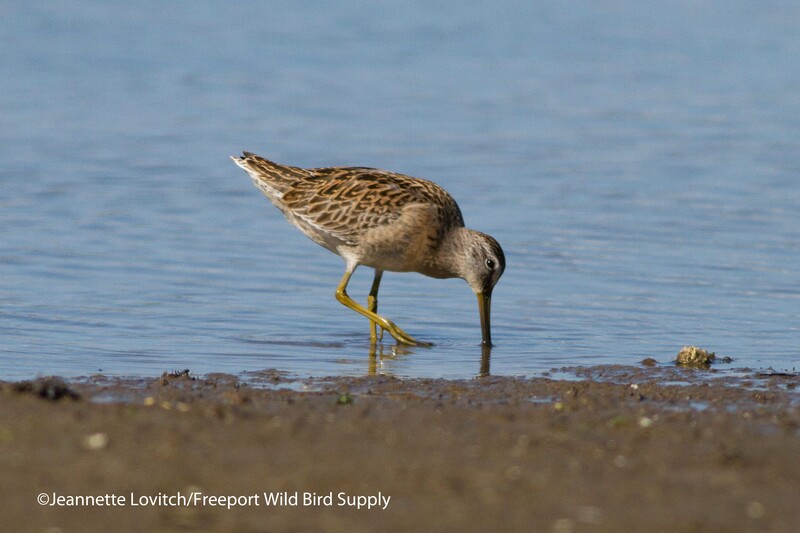 Juvenile Short-billed Dowitcher, Pine Point, 8/24. Adult Semipalmated Plover, Pine Point, 8/24. Adult and juvenile Semipalmated Sandpipers with one juvenile Semipalmated Plover, Pine Point, 8/24. Adult Pectoral Sandpiper and juvenile Least Sandpiper, Eastern Road Trail, 8/24. Adult White-rumped Sandpiper, Eastern Road Trail, 8/24. 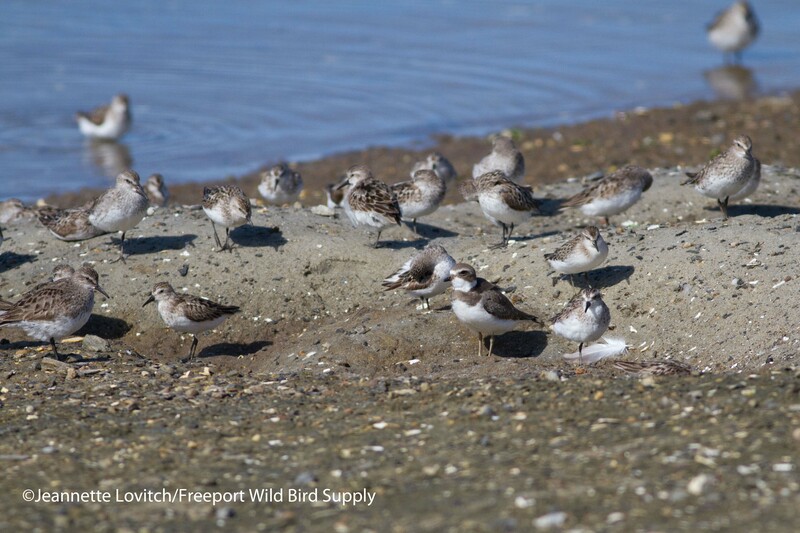 Semipalmated Sandpipers with one adult Semipalmated Plover and one adult Sanderling, Biddeford Pool Beach, 8/25. Of course, it’s not just shorebirds that are on the move – there are plenty of passerines as well! A migrant Wilson’s Warbler and a whopping 14 Ruby-throated Hummingbirds were at Old Town House Park on Saturday morning when I visited it with my Saturday Morning Birdwalk group. My tour group to the Poplar Hut encountered mixed-species foraging flocks as we hiked to and from the hut, highlighted by an immature female Cape May Warbler in a little wave around the hut itself on Sunday morning. Other highlights this week included 14 Wood Ducks and a bumper crop of juvenile Common Yellowthroats at Florida Lake Park (8/24), the whiter of the two Tricolored Heron x Snowy Egret hybrids (“Splotchy”) in the Rte 1/9 salt pannes in Scarborough Marsh with Jeannette on the same day and a drake White-winged Scoter off of Biddeford Pool Beach on 8/25. While a diversity of shorebirds will continue for several more weeks (and there’s a better chance for Western, Baird’s, and Buff-breasted Sandpipers), I tend to spend less time focusing on them (and therefore not enough time at enough prime locations over the course of the week), and therefore only occasionally post summary totals. In fact, if the much-reduced numbers at Popham today are any indication, a lot of shorebirds departed with the passage of this recent cold front. Instead, I spend most of my free mornings now at “my office,” the bridge at Sandy Point Beach, Cousin’s Island, Yarmouth, observing and obsessively counting migrant passerines in the “Morning Flight.” In fact, my first visit of the season there on Thursday morning yielded 438 migrants, including 17 species of warblers, 1 early Dickcissel, 1 Blue-gray Gnatcatcher (my 3rd-ever here), and 5 Prairie Warblers – my 2nd highest count. (Much) more on that soon. 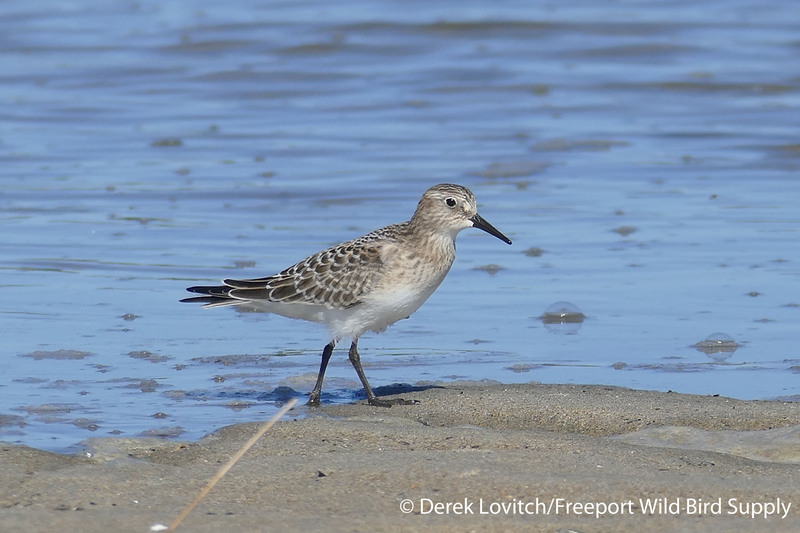 This entry was posted in Birding in Maine and tagged "Birds, Baird's Sandpiper, Biddeford Pool, Birding, Black-bellied Plover, Least Sandpiper, Morning flight, Pectoral Sandpiper, Pine Point, Popham Beach State Park, Sandy Point, Scarborough Marsh, Semipalmated Plover, Semipalmated Sandpiper, shorebirds, Wells Harbor, Wharton Point, White-rumped Sandpiper on August 28, 2015 by Derek.